But the legislative effort should have yielded so much more. Food and agriculture systems in the United States and around the world face fundamental long-term challenges posed by resource scarcity, population growth, climate change, invasive pests, pathogens and diseases, rising consumer incomes in low- and middle-income countries, and shifts in relative economic power. These challenges demand forward-looking leadership. The 2014 farm bill did not provide it. The Farm Bill conference committee report, released today, includes $800 million per year in cuts to the Supplemental Nutrition Assistance Program (SNAP), the nation's largest anti-hunger program. The conference report likely puts to rest several years of debate between the Republican-controlled House of Representatives, which sought much steeper cuts, and the Democratic-controlled Senate, which sought less severe cuts. Both houses of Congress are likely to pass the compromise in the conference committee report this week. The compromise is a disappointment to anti-hunger advocates. Program participants already in November faced the end of a temporary boost to program benefits. These new cuts are in addition to that change in November. Yet, in a sense, the cuts proposed today were inevitable, and about as mild as program supporters could expect. The actual mechanism for most of the cuts is a change to how utility costs are counted when benefits are calculated. Certain utility costs count as "excess shelter expenses," which are deducted from gross income during the computation of net income. SNAP benefits are based on net income (those with higher net income get smaller benefits), so eliminating a certain type of utility cost deduction amounts in practice to the same thing as a benefit cut. The SNAP cut ... is a provision to tighten an element of the SNAP benefit calculation that some states have converted into what most people would view as a loophole. Specifically, some states are stretching the benefit formula in a way that enables them not only to simplify paperwork for many SNAP households, but also to boost SNAP benefits for some SNAP households by assuming those households pay several hundred dollars a month in utility costs that they do not actually incur. Congress did not intend for states to stretch the benefit rules this way, and longstanding SNAP supporters like myself find it difficult to defend. Moreover, a future Administration could close off this use of the rules administratively, without any congressional action. If I were king, the social safety net would be more generous. Our society would be a better society if we treated the poor and hungry as brothers and sisters. Who among us, in speaking of a poor or hungry brother or sister, would hesitate to provide resources before offering unsolicited advice? In several ways, I would make the social safety net more respectful of the dignity of its participants. But I am not king. I am proud instead to live in our semi-functioning democracy. This Farm Bill compromise on nutrition assistance is about as good as I expected from the current Congress. The burden lies with program supporters first to persuade more voters of the value of these programs and then second to press for more generous program benefits. The madness of click-friendly headlines: How --- can save the planet! I have this strange vision of a hundred planets lining up in the aisle of a church for the televangelist to push their foreheads and pronounce them "saved." Grazing cows can save the planet (according to Mercola recently, which provoked this blog post). Vegetarianism can save the planet. Fruits can save the planet. Hemp can save the planet. Bamboo can save the planet. Worm farming can save the planet. Bicycles can save the planet. Wall Street can save the planet. Capitalism can save the planet. Economic growth can save the planet. Telecommuting can save the planet. Only a challenge to corporate power can save the planet. Women can save the planet. Sensitive men can save the planet. Slums can save the planet. Personally, I am not certain the planet will be saved in any case. My wife and I seek to raise our children to be robust and even happy in the face of hardship, just in case their adulthoods are less prosperous than their childhoods. Adaptation in rich countries to lower resource use (not lower well-being, just lower resource use). Continued economic growth and social transformation in poor countries (allowing much higher well-being with moderately higher resource use). New technologies that grow more food and produce more energy with less land and less environmental impact (but technology is not magic and will not suffice on its own). These three things may happen. Some environmentalists are rethinking their opposition to genetically modified organisms (GMOs). That's terrific. The line between GMOs and non-GMOs always was the wrong way to describe the problem our food system faces. The best road forward for environmentalists and sustainable food thinkers is to end the monopoly that the GMO/anti-GMO fight has had on our food system debate. Like breaking up a big corporation so that smaller businesses can thrive, let us break up the GMO debate into its smaller pieces. The highest-profile recent example of an environmentalist writer rethinking GMOs is Nathanael Johnson's six-month series at Grist. Johnson points out that GMOs are just one contributor to the many ills that have been attributed to GMOs. Hence, a world that had no GMOs would be surprisingly similar to our current world. GMOs were neither the first, nor have they been the last, agricultural innovation, and each of these technologies comes with its own potential hazards. This view infuriates some of the most respected people in the sustainable food movement. This week at Civil Eats, Anna Lappé describes Johnson as "meandering about in the woods for the past six months" leading to nothing more than an "attempt at a clever journalistic gesture." I read Johnson's series more favorably, and I'm not the only one. Dan Charles has a nice overview at NPR's Salt. Well, nobody said every post at Civil Eats had to be civil! After the strong criticism, Lappé then turns to an excellent list of seven real issues at stake. Support farmers to learn practices for productivity that don’t come at the high, and rising, cost of inputs such as chemicals, seeds, or technology fees to chemical companies, especially Monsanto. This is a fine list of seven enterprises that are left behind after we break up the GMO/anti-GMO monopoly on our public debate. In a way, by focusing on seven multi-faceted challenges, rather than on the technical line between GMO and non-GMO foods, Lappé seems to me closer to Johnson than it might appear at first. What attitude should anti-GMO environmentalists and GMO-tolerant environmentalists adopt toward each other, when they agree on these seven global challenges? I think they each should say, "Hi, friend, let's get to work!" This blog's previous coverage of checkoff controversies includes the Humane Society's earlier work on the sale of the pork checkoff's "Other White Meat" brand, and the results of my 2006 Freedom of Information Act (FOIA) request that triggered the Humane Society's interest in this topic. It is sometimes said that there is no need for a government role in dietary guidance, because people know how to eat well and simply lack the willpower to do so. Is it true that people in the United States already know how to eat healthfully? While many nutrition and health experts say that something is wrong with U.S. eating patterns, they disagree about what is unhealthy. A long tradition, including the physician Robert Atkins and the science writer Gary Taubes, blames carbohydrates for weight problems and recommends a diet that may be high in meat and saturated fat (Taubes, 2007). An equally well-developed tradition encourages a low-fat plant-based diet and blames meat consumption for health problems (Campbell and Campbell, 2007). The respected epidemiologist Walter Willett and colleagues at the Harvard School of Public Health advise a mostly plant-based diet that is not necessarily low in fat, allowing plenty of vegetable oils (Willett et al., 2005). Others, including former FDA Commissioner David Kessler and journalist Michael Pollan, are most concerned about the highly palatable artificial creations of an industrial food system (Kessler, 2009). These views about diet and health are partly overlapping and partly contradictory. Yet at least some scientific research in peer-reviewed journals can be found to support each one. To make sound judgments, a layperson needs a skeptical attitude towards dietary fads and a trustworthy summary of the balance of the scientific evidence. One influential summary of the scientific evidence is the federal government’s Dietary Guidelines for Americans (U.S. Department of Agriculture and U.S. Department of Health and Human Services, 2011). The federal government issued the first Dietary Guidelines in 1980 and has revised the document every five years since then. Regardless of a reader’s own views on diet and health, it is useful to understand the mainstream position of the Dietary Guidelines on controversial questions in nutrition science. The Dietary Guidelines for Americans is used as a source of evidence for claims about diet and health on food labels (see Chapter 9). 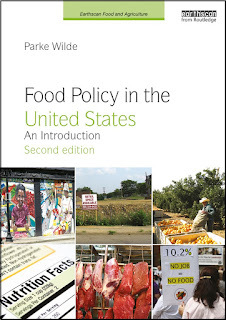 It provides key inputs for USDA’s Thrifty Food Plan and other model diets for people at different income levels (see Chapter 10). It informs policies and regulations for nutrition assistance programs, including school lunch and school breakfast (see Chapter 11). explores several policy instruments that have been proposed to guide Americans toward healthier food choices (Section 8.6). Food policy advocates and "personal responsibility"
Jayson's answer, expressing a balanced sense of personal responsibility combined with awareness of environmental influences, is fine. It is worth adding that many food policy advocates talk about "personal responsibility" all the time. Just do a search for "Michelle Obama" and "personal responsibility." You will find the topic thoroughly covered by the Cato Institute (an institution rarely accused of being part of the "Food Police"!). You will find a lively discussion of how much the Obamas emphasize "personal responsibility" in tough non-pandering commencement speeches. The Obamas' views, with a mix of personal responsibility and public purpose, sound a lot like Jayson's. The Casual Kitchen, and Jayson too, can win arguments any time they like against the almost satirically narrow-minded caricature of the "Food Police" that they have set up. But, perhaps it will become boring after a time to knock down row upon row of carnival dolls sitting on a shelf. If so, they will want to engage in greater detail the issues that Michelle Obama raises in her speeches for the "Let's Move" campaign. Here is a good speech to begin with.